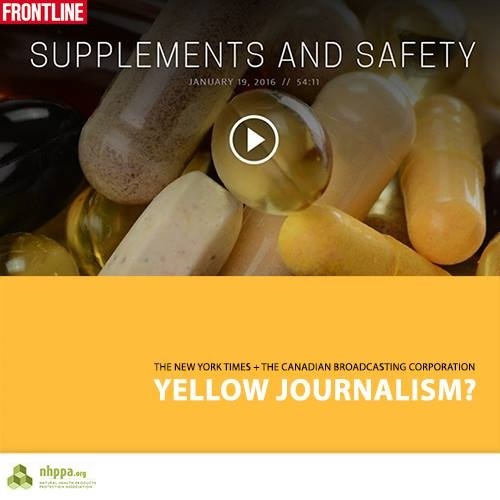 “Yellow journalism” is thriving in mainstream media on topics related to Natural Health Products (NHPs). Yellow refers to the colour of ink used at two rival New York City newspapers when the battle for readership was fought through exploitative, and even fabricated, news. We shared with you CBC’s the Fifth Estate’s episode “Magic Pills” debacle over the past couple of months, and their eventual retraction. Read Shawn Buckley’s rebuttal. We’d consider what the CBC did yellow journalism. PBS’s programming is questioned from the use of yellow journalism in a Frontline episode that aired January 19, 2016. Watch the full “Supplements and Safety” episode. Several natural health advocates and practitioners were quick to call them out on perpetuating the misconceptions and myths surrounding NHPs and their lack of safety and effectiveness. 2. Supplements are untested and unproven! They reach the market without being tested and without proof of safety and effectiveness! 3. With pharmaceuticals, it is different! FDA thoroughly tests drugs before they are marketed! 4. Supplements are dangerous, even deadly! Our friends at Alliance for Natural Health (ANH USA) published an article on January 26, 2016, “Has PBS Become a Front for Big Pharma?” calling out several of their erroneous and misleading statements as well.